Kinneff Young Farmers held their Christmas classic stock judging at Thainstone at the start of the month. Newest member Hugh Gordon came first over all with 244 points. Hugh along with Euan Robertson and Greg Johnstone all came first in the junior section. 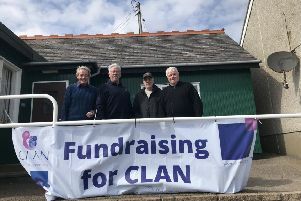 The group also had a visit to ARI to look around the dialysis unit and presented a cheque for £600 for help raise funds for the Stonehaven dialysis unit. The group also had a talk from Dr Ann Humprerys.